Since I’ve moved rooms in my house recently and have had to downsize since I was moving into somewhat of a smaller space. I now have an office and I have downsized from having an entire room as my closet. My bedroom now houses my clothes, accessories, and my beauty corner which I’ve been wanting to share. It’s to my liking after finding the right, practical organization over the past week and I’m in love with it. I’ve never really wanted a vanity because I know I’m not going to sit down and do makeup every day. It’s very rare that I wear makeup and I’m more of a lipstick girl. Anyway the drawer system was something I knew I needed and the system I have is the South Shore Chocolate 5-Drawer Dresser from Walmart. Time to zoom in on the organization & decor. First up in this built in shelf that’s been in this room for as long as I can remember. 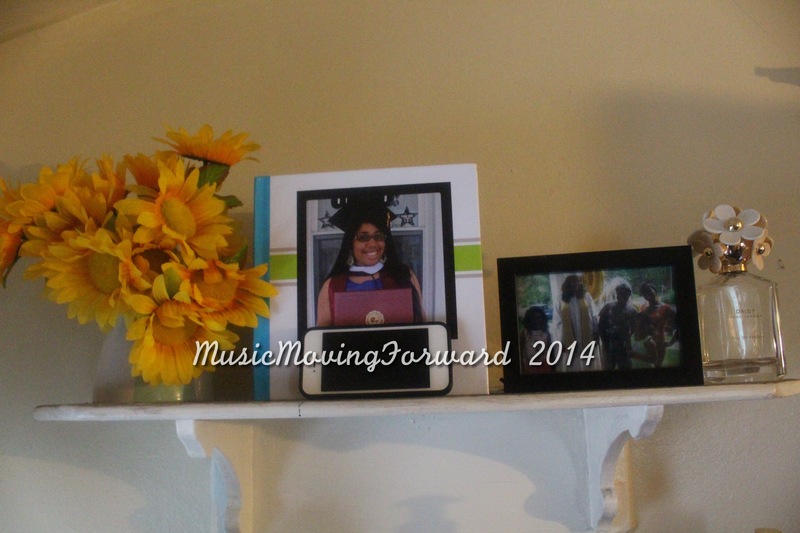 It’s an older house and a lot of things are pretty permanent, but I used this shelf to add a bit of spring and to display my academic achievements. I have my college graduation book that I made on Shutterfly. (My phone is covering my name.) I also have my graduation picture which is right next to my Marc Jacobs Daisy perfume that is empty, but I love the packaging so much I don’t want to throw it away. On the other end I have a flower pot from an Edible Arrangement filled with fake flowers from Dollar Tree. As for the top of the dresser I tried to keep it as minimal as possible. I do have two organizers that I purchased from Target. 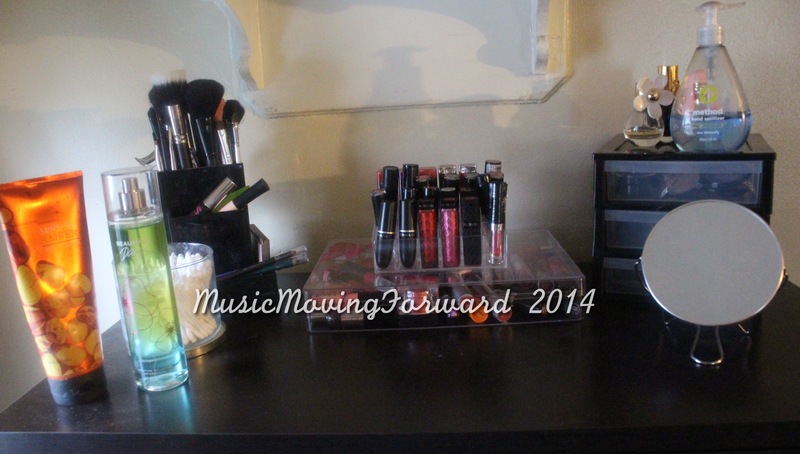 The desk organizer holds mascara, a few eyeshadow palettes, and eye pencils. The drawers hold my surplus of eyeshadows and a couple blushes. Both containers cost me no more than $6. The lipstick holder I purchased on Ebay and it holds my Mac lipsticks, Revlon, Wet n Wild and one RImmel. The bottom container holds the rest of my lippies and it was in a Color Workshop set I received. The rest of the stuff on my dresser are the lotion and body spray I use daily along with my mini perfume collection, hand sanitizer, and mirror. Time to move on to the drawers. 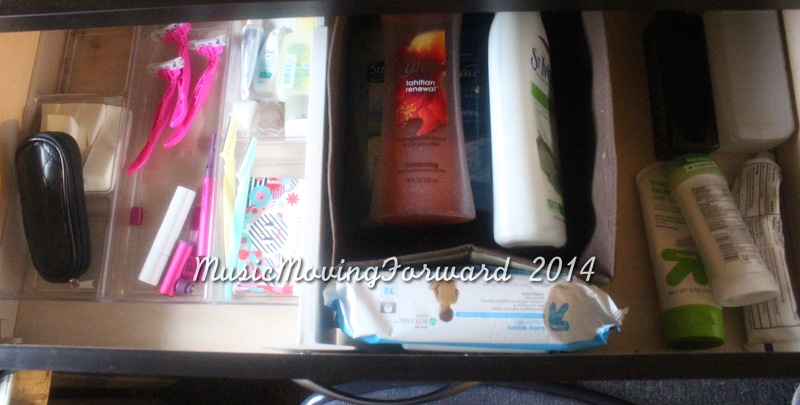 My first drawer holds everyday products such as body wash, fascial scrub, brush cleanser, razors, etc. I organized the drawers by the frequency I would reach for something. The next drawer holds all of my surplus lotions and body sprays. I’ve purchased most of those on sale and I am currently on a NO BUY of those products no matter how much of a sale because I want to use what I have. The 3rd drawer has like nothing inside of it. It’s my candle collection that I’m working on. I will say that the next time a candle sale happens at Bath & Body Works I do want to stock up on my favorite scent Pineapple Mango. The 4th Drawer holds my nail polish and hair stuff. Nothing really major. I’ve recently downsized on my nail polish and I hope to downsize some more. One container is a great size compared to me once having 3 full containers of that size. The last drawer just holds some of my blankets which I’ll use more in the summer & football seasons. The purple one is crocheted and a birthday gift from my grandmother. The leopard one was a Christmas gift from a friend. The other side of the drawer is my Steelers section which has 2 blankets & my Terrible Towel. Well that’s my beauty corner and I really couldn’t be happier. I do not plan on downsizing anymore or purchasing, unless it’s candles ^_^!